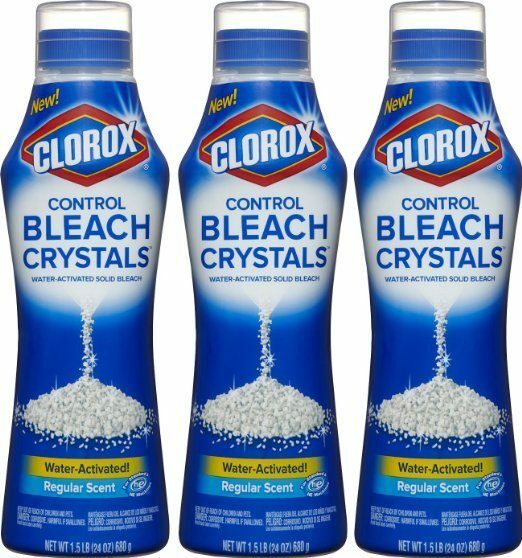 Clorox Control Bleach Crystals, 24 Ounce, 3 Count Just $8.03! Ships FREE! You are here: Home / Great Deals / Amazon Deals / Clorox Control Bleach Crystals, 24 Ounce, 3 Count Just $8.03! Ships FREE! We have a great deal on this Prime exclusive! Get Clorox Control Bleach Crystals, 24 Ounce, 3 Count for Only $8.03! Ships FREE with Subscribe & Save! Regularly $10.71, you get 5% off for Subscribe and Save, but their is an additional 20% off coupon as well! That’s $2.68/bottle and currently they are $3.57 at Walmart! Go HERE and clip the 20% off coupon (just below the price). Change your delivery frequency on the right-hand side of the page. Even better, when you subscribe to five or more items arriving in the same month, the price will drop to just $6.96!